No one is too particularly sure of Reverie's past.It is generally assumed that she was born in a lab or, alternatively, was in some sort of freak accident. However, she was found wandering an area where there was a sudden outbreak of rabies, her being the apparent Patient Zero. 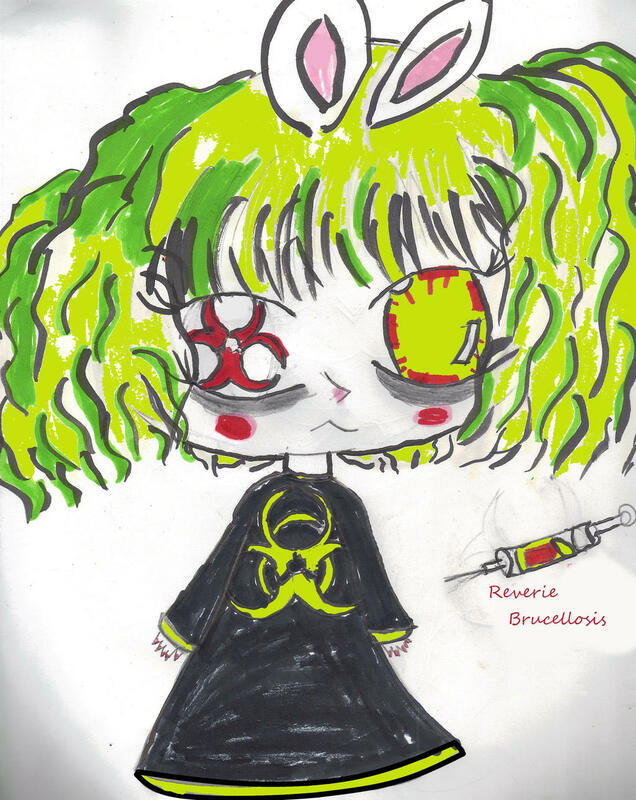 She wears a black dress with a neon yellow chartreuse hems, collar, and cuffs, along with a large bio-hazard design on it. She has neon yellow chartreuse hair with green patches and wears red nail polish. One of her eyes has a red iris in it that resembles a bio-hazard symbol and the other eye is yellow chartreuse with bits of red and she also dark rings under her eyes. She is an often nice, cheerful, and thoughtful child, generally well-meaning, however, she has a set of morality codes different from conventional ones and she doesn't comprehend the wrongness thereof. Personnel are required to handle her with metal plated hazmat suits and she's given a typical cell 10x20 with bedding, entertainment, and toys, the which are often cleaned and rotated. Apparently, she doesn't seem to mind (so long as she can hug staff).